A local Dallas business, Poo~Pourri, wanted to advertise with us digitally, but they wanted something different. We created a custom advertising opportunity that aligned with their tongue-in-cheek brand. 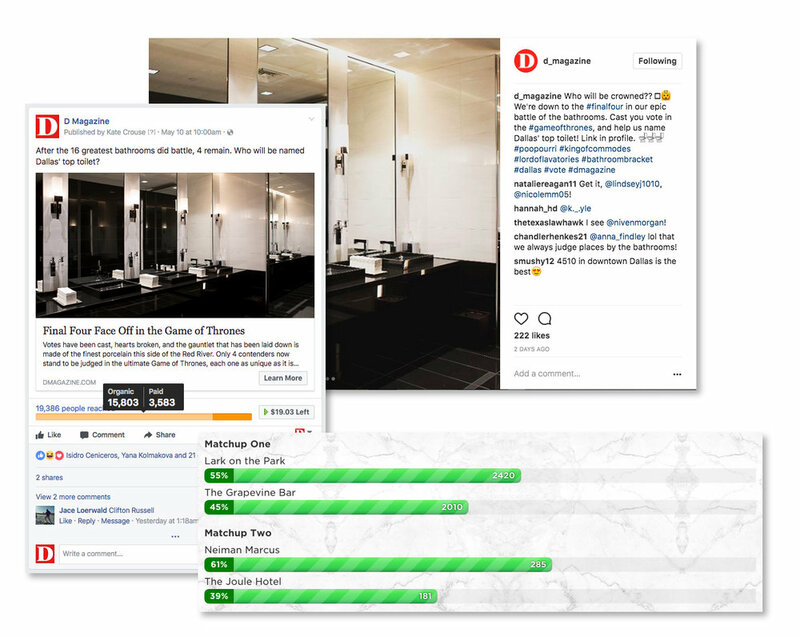 We took an editorial tool (a march madness style bracket) and converted it to a sponsorable, native feature where users vote on the best public bathroom in Dallas. We promoted the competition heavily on our social media channels. The businesses in the bracket also took to their Facebooks and Instagrams to encourage their patrons to vote on their behalf. The result was higher than average user engagement—more votes, higher reach, and increased opt-ins. Due to heavy promotion, and grass roots strategies such as giving away shots to anyone who voted, local dive bar, The Grapevine, took home the Golden Throne. The results were unpredictable and the advertiser loved that.